a, The Fermi/LAT γ-ray light curve is shown as two-week binned photon fluxes between 100 MeV and 300 GeV (black), the Bayesian blocks light curve (blue), and the HESE-35 time stamp (red line). The HESE period (May 2010 to May 2013) and the included outburst time range are highlighted in colour. Only statistical uncertainties are considered and shown at a 1 sigma confidence level. An international team of researchers has spotted the first instance of a high-energy neutrino collision from a source outside of the Milky Way, marking what they describe as a significant discovery. In their paper* published in the journal Nature Physics, the team describes their work at the South Pole Neutrino Observatory, the details pertaining to the sighting and why they believe their discovery may lead to a new era in neutrino astrophysics. Neutrino’s are massless and have no charge and very seldom interact with other matter—the exception is when they collide head on with another particle. Scientists have been studying neutrinos for several years, believing that they may hold the key to understanding many parts of the universe that remain otherwise hidden from our view. To see evidence of them, researchers fill large underground tanks with different types of fluids and then use extremely sensitive sensors to capture very brief flashes of light which are emitted when a neutrino collides with something in the fluid. The team with this latest effort has taken a different approach, they have placed sensors around a kilometer sized ice cube 2.5 kilometers beneath the surface, in a location near the South Pole. The sensors capture the brief flashes that occur when neutrinos collide with particles in the ice. Capturing evidence of collisions does not happen very often, but when it does, it sets off a chain of events that center around trying to ascertain where the neutrino came from—most come from the sun or cosmic rays striking our atmosphere. But back in 2012, the team captured evidence of what they described as the most powerful yet, registering two petavolts. 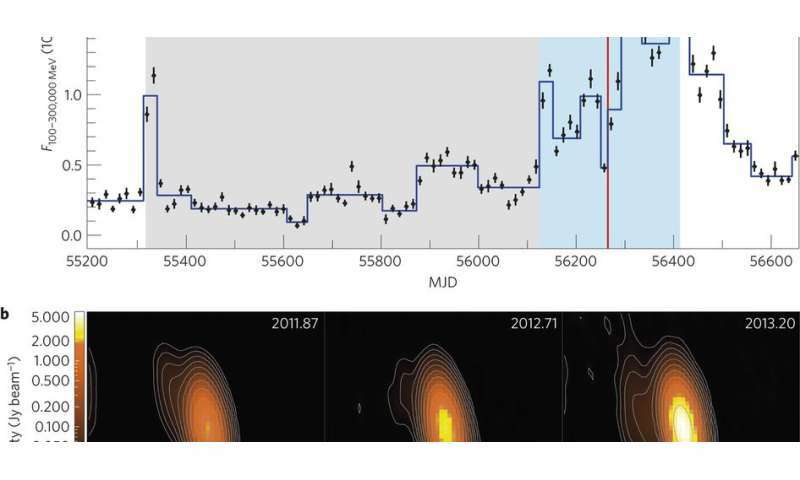 Following that discovery, the team used data from radio telescopes, and in particular data from a galaxy that has been named KS B1424-418—astrophysicists have been studying it for several decades and it had been observed to undergo a change in shape during the time period 2011 to 2014. After much analysis, the team confirmed that the neutrino collision they observed was due to an emission from that very galaxy, making it the first neutrino collision to be traced back to a source outside of the Milky Way.